To prove the mettle of the Geländewagen SUV, Mercedes' Australian arm arranged a 14-day trip over the 1,242-mile Canning Stock Trail for journalists — at least, that was the plan before five of the six vehicles broke down. 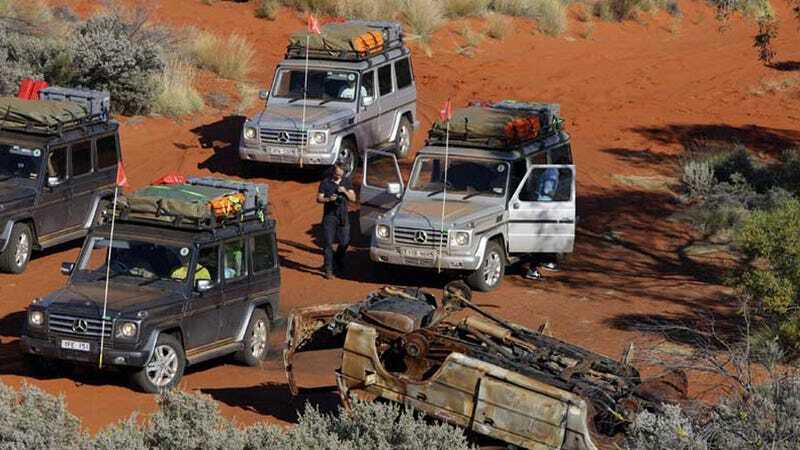 The stock Geländewagens suffered rear shock absorber failure after six days on the brutal Canning Stock Trail in western Australia, stranding the 14-person excursion. Mercedes flacks spun the failures as a welcome test, saying they had avoided aftermarket upgrades as an experiment. The caravan had to stop for two days while parts were flown, then trucked into the Outback — probably in some kind of GM vehicle, just guessing. But there's was also just a slight undermining aimed at a few passengers — like the BBC TV journalists who arrived with 132 lbs. of luggage and were instantly nicknamed "Coco" and "Chanel." Who does Mercedes thinks actually buys a G-Class these days?